FAQ – Sycamore Speedway : Midwest's Best Clay Track! A: Credit cards are only accepted in our souvenir stand. We do have an ATM on site for ease of cash withdrawal. Atm is located just inside the main entrance of the speedway. All food, ticket, and beer stands accept cash only. A: This is a tricky question and can have a very long answer. To be as simple as possible, during the week we are not open to the public. On Friday race nights we open at 6pm. On Saturday race nights we open the pits at 4pm and General admission gates at 6pm. And Sundays are reserved for our personal families. Q: Why don’t I see Late Models, 4 Bars or Mod Compacts on the schedule? A: They are still racing with us but we have decided to change the name of the classes to better fit the industry standard. Sycamore Speedway’s Late Model class is now called Street Stocks; the 4 Bars are called Dirt Late Models, & the Mod Compacts are Hornets, all bringing you the same quality racing entertainment as always. A: For the 2018 Race Season; Friday Qualifying starts at 7:15pm and races will follow Qualifying. Saturday Qualifying starts at 6:30 pm and races will follow Qualifying. Q: Can I bring my own food and drink into the Speedway? A: Sycamore Speedway does not allow outside food or drink. We offer full concessions. In our concession stands you can purchase a wide variety of food and drink. Q: Why would the races get cancelled? A: There are several reasons that we may not be able to race at all or not complete a night of events once started. We are a clay race track and too much water may make the race surface unsafe for our drivers. It is raining out and we are a complete outdoor event. It can take time for the track to dry out and sometime what feels like a little sprinkle is enough to ruin a clay race track. Q: How would I know if the races have been cancelled? 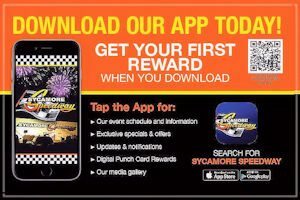 Download our new Smart Phone App – search SycamoreSpeedway in the app store or Google Play. Join our mailing list for email blasts. Q: What is the official rain out policy once races have started? The program will be considered complete (no rain checks) if 4 or more events, not including time trials, have been run. If a special event was rained out, the special event may be added to the next weeks race show. In the event of rain, or any circumstances beyond the control of the Speedway Officials, the race may be declared complete or continued at the discretion of the officials in charge. If the program is not considered complete (see no. 1) your ticket stub or pit pass wristband will serve as a rain check for another race held within the next 2 race nights unless otherwise stated by Sycamore Speedway Management. A: You are more than welcome to camp overnight but there are NO amenities. Q: Can I pre-purchase my tickets and reserve my seats? A: No, we do not offer advanced ticket sales nor reserved seating. Our seating is bleacher style and there is no assignment to them. All tickets are purchase at the gate on the evening of the event. Q: Will my young child enjoy the speedway? A: Racing is a sport for all ages. Some may find that it is a little noisy and dusty, feel free to bring appropriate attire for this. If you happen to not have any or forget we sell these type of items in our full souvenir stand. Q: Can children go into the pits? A: Those under the age of 14 cannot go into the race pits. If you are between the ages of 14 and 17 you must have a minor release in order to enter the pits. A minor release only has to be completed once for every season and can be obtained at the pitshack on race nights.